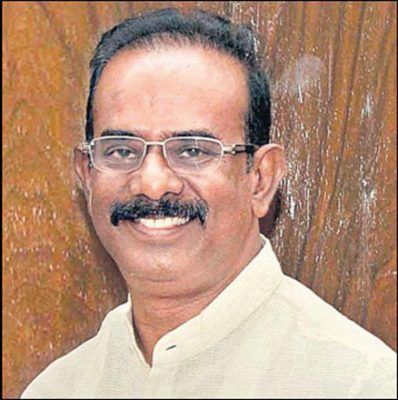 Hyderabad: The BJP, which promised inclusive development of the country, gave nothing to Telangana and had even refused to honour the Central government’s promises as per the Andhra Pradesh Reorganisation Act, TRS MP Boora Narsaiah Goud said on Tuesday. He faulted the Centre for not responding to the requests of the State government to accord national project status to Kaleshwaram project. He accused the Centre of ignoring recommendations of NITI Aayog to sanction Rs 23,000 crore for Mission Bhagiratha, an initiative of the State government to provide drinking water to every household. “The BJP promised ‘Sab ka Saath, Sab ka Vikas’. But it gave an empty hand to Telangana,” he added. Taking up the issues in Lok Sabha during the discussion on the Finance Bill, Narsaiah Goud reminded that as per the AP Reorganisation Bill, the Centre promised an Indian Institute of Management, a National Institute of Design, a IIIT at Karimnagar, a National Investment and Manufacturing Zones (NIMZ) at Zaheerabad, a steel plant at Bayyaram and also tax incentives for backward districts in both Telangana and Andhra Pradesh. None of them was kept in the entire tenure of the NDA government, he said. The Bhongir MP also took up the issue of enhancing reservations for STs and minorities in the State and pointed out that the Centre, which did not respond to the resolution passed by the Telangana Assembly to hike reservations in the State, had passed a bill to provide 10 per cent reservations to economically backward classes (EBCs). The Constitution does not mandate limiting reservations to 50 per cent, he said. “But when the Supreme Court passed the orders, the Centre remained silent without challenging the same or making necessary amendments for implementing enhanced reservations as per the State population. What prevented the Centre to allow the Telangana government to implement enhanced reservations on population basis when it had no problem in extending reservations for economically backward classes surpassing the total reservation quota of 50 per cent?” he questioned. Narsaiah Goud faulted the Union Finance Minister for ignoring aspirations of OBCs (other backward classes) who form 50 per cent of India’s population and allocating only Rs 1,200 crore for their welfare. He also slammed the Central government for providing only 1,000 scholarships for OBCs across the country. Though the NDA government accorded the Constitutional status for National Commission for Backward Classes during its tenure after 25 years of wait, no commission was constituted till date. Meanwhile, Karimnagar MP B Vinod Kumar demanded that the Rajiv Rahadari be upgraded to a National Highway during Question Hour in the Lok Sabha. He said due to increased traffic, several fatal accidents were taking place on the road which connects Hyderabad with Karimnagar and Ramagundam. “The road was developed on a public-private partnership mode about a decade ago. Considering the increase in traffic, it needs to be upgraded into an NH by extending it to Nagpur via Mancherial and Chandrapur,” he said.